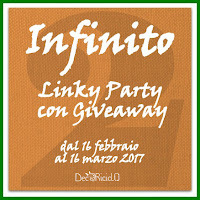 Today I want to show you this elegant Infinite Tricotin Necklace I created for Daniela’s February link party and with which I also joined the "CRAFT SCHOOLING SUNDAY" Sara's party. Maybe some of you are wondering what tricotin is. Also known as French knitter, this object is essentially a very small circular knitting loom you can use to make tubulars (tutorial links at the end of the post). Our grandmothers had a lot of fun with this craft tool entertaining children long time ago and rediscovered nowadays to create several kinds of objects, from home decorations to jewels. Craft stores sell the traditional manual tricotin and even an automatic version that makes you work faster. So I bought a tricotin machine few years ago and it was love at first usage. Later, as I needed different tubular sizes, I also built several manual tricotins by myself, like the one I used to create the i-cords of the necklace I showed in this post, which is a small three pins tricotin I made by recycling the plastic tube of an old lipstick; it was indeed perfect to create very thin tubulars by means of my 1 mm gold crochet thread (Anchor Artiste Metallic Yarn). Daniela’s contest challenge is to materialize the infinite concept through our favourite creative techniques. 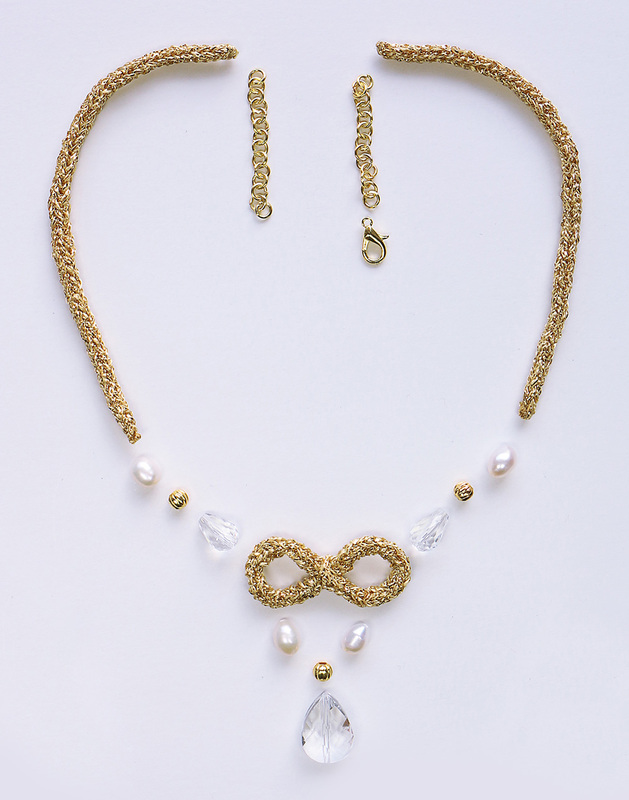 I was not sure about what to create at the beginning, but the idea of designing a jewellery piece came to my mind at some point: a necklace including a kind of infinity sign, nowadays so fashionable, which will show your sense of infinite to everyone. What colors could depict the infinite in that necklace I wanted to design? First of all: what is the infinite? I can tell you what infinite reminds me, that is the beauty of intuition, the spiritual dimension of everyone and God; however, I couldn't find a concrete object to be associated with this word. “Maybe I can get near the infinite if I think to something untouchable, invisible and ethereal, which means transparent like air in my mind”, and a first idea about the colors for my necklace came through this consideration. Moreover, I remembered to own some beautiful crystal-clear glass drop beads, unused for long time and perfect for this design. But that no-colors choice was not enough for my necklace, which I wanted to make precious, with a tone of solemnity. And I found a solution almost immediately: my sparkling yellow-gold crochet thread stood out like a prince from the yarn balls crowd stored in my shelves, and claimed to be part of the infinite project. This thread is so luxurious and beautiful indeed, but I realized how to involve it only after an idea about the shape of the necklace came to my mind. I wanted to design something gracefully simple and short (necklace princess length that is around 44 cm), especially suitable for lower round necklines. So I decided to embellish the necklace by using some soft, thin, gold i-cords ... to be made by means of my self-built tricotin. Therefore I created a tubular and shaped it into the infinity sign, by passing a thin copper wire through the center section of the i-cord. I really loved the result I achieved. 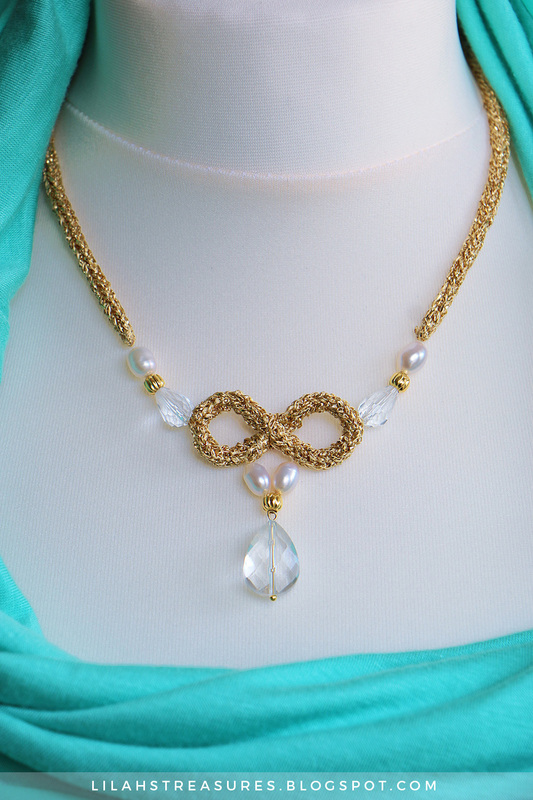 Then I sewed my crystal-clear drop beads to each side of the infinity sign by using a 0.10 mm transparent nylon thread, into which I also threaded some gold spacers and white elegant pearls. Or not? I mean: it looked so beautiful like it was, but other creative thoughts came the day after, and I decided that a little "pendant part", hanging from the infinity sign, would enrich the design by creating a special effect capturing the observers attention. I was really satisfied with my Infinite Tricotin Necklace and I think it is perfectly suitable for clear tonalities and looks great in combination with summer colors like peach and teal, which I really love. Do you like my necklace? How would you model the infinite? I wish you will have a great creative time! Sono contenta che ti è piaciuta la collana, frutto di un gran momento d'ispirazione. Che meraviglia! Mi piace tantissimo! Grazie Lilah per la tua visita al mio blog e per il commento. Mi hai dato l'opportunità di conoscere te e il tuo bellissimo blog. Oltre ad essere una bravissima creativa fai delle foto stupende! Complimenti! E' nato come luogo virtuale di aggregazione di creative siciliane, ma è aperto a chiunque sia interessato alla creatività a 360°. Vieni a dare un'occhiata. Penso che troverai delle belle ispirazioni e anche la compagnia di persone simpatiche che hanno i tuoi stessi interessi. Ciao, Rosa. Che bello aver trovato un'altra siciliana in rete...Ti ringrazio per i tuoi graditissimi complimenti e per essere passata da qua. Grazie anche di avermi segnalato il tuo forum che visiterò con piacere. A presto! Wow! Ma è davvero bellissima questa tua collana! Molto interessante l'uso che hai fatto del tricotin, complimenti, davvero originale. Sono contenta che il mio linky ti abbia ispirata a concretizzare un'idea che avevi in mente da tempo, e ti ringrazio per la tua graditissima partecipazione. Mi è anche piaciuto leggere il processo creativo che ha portato alla realizzazione di questo gioiello. Grazie a te, Daniela, per l'organizzazione dell'evento. Hai scelto un tema importante per il link party e da cui si può trarre davvero tanta ispirazione. Sono contenta che hai apprezzato il mio flusso di coscienza creativo! Bellissima collana, davvero molto originale ed elegante!! Grazie di cuore del complimento Lulù. Sono contenta che ti sia piaciuta! Lilah, your infinity necklace is divine! In every sense of the word having in mind the topic of the challenge. So elegant, delicate and stunning! The i- cord you made is perfect. I have bought a couple of knitting Nancies but still haven't used any. But they are for large tubes not these perfect, small tubes you made. Dear Maya, I'm so glad you liked my "Infinite necklace" and I really loved your nice comment. Generally, knitting spools you find in craft stores can create large tubulars; hence I started making my own tricotin for small I-cords, like these ones forming my necklace. There are lots of tutorials on internet explaining how to make a knitting spool. Just try to make one and have fun :)! wow, gorgeous, and made with a knitting spool, amazing! thanks so much for sharing and your very lovely link back to the party, appreciate it! Hi Anna, thanks for your kind comment. Your Craft Schooling Sunday is a cool initiative and I'm happy to support it! Dear Anna, thanks a lot for your visit and nice comment. Complimenti per la collana è stupenda! Grazie della visita. Grazie per il bel complimento e per la visita, Hamina!! Ciao Clara, sono contenta di sapere che la collana ti sia piaciuta. Ti ringrazio di essere passata da qua, e ci vediamo sul forum! Anche io penso che i gioielli realizzati con queste tecniche debbano essere luminosi. Il filo dorato luccicante mi piace proprio e penso che lo userò per realizzare altre collane. Grazie anche a te per la visita e per il tuo commento così carino :). Ti seguo anche io! Felice che tu mi abbia trovata e di averti in visita nel mio blog! A prestissimo!